You might think that any town whose website lists its public library as a tourist attraction would be in need of some excitement. However, Atikokan actually has a fair amount to do. Atikokan started off as a mining town when ore was discovered nearby in 1938. After diverting ten kilometres of river, damming the water flow, and draining a lake, workers had shifted twice the amount of earth moved to build the Panama Canal in half the time it took to build the world famous waterway. For even more history, check out Charles Dobie’s site. Atikokan subsisted on two mines until 1980 when both closed. Today, Atikokan is known for forestry, hunting, canoeing, hiking, lodges, and a coal-fired power plant that is constantly giving the area’s local MPP a kink in his party’s anti-coal platform. The town is now home to 3400 citizens. 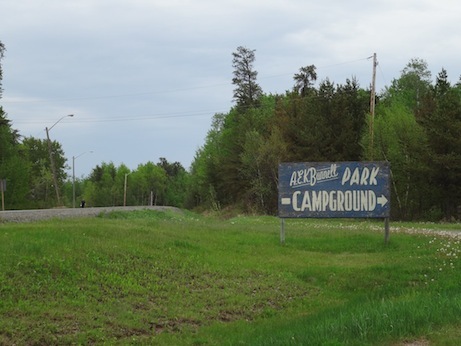 Atikokan is a good spot for fishing, camping, or starting a wilderness journey – it’s not called the “Canoe Capital of Canada” for nothing. Atikokan has great access to Quetico Provincial Park, a wilderness park often recognized as one of the most beautiful places in Ontario, if not in Canada. As well, there is the White Otter / Turtle River Wilderness Area just north of town and public swimming at the beach on Crystal Lake. Other tourist attractions include tours of the local walleye hatchery, Scenic Little Falls, the Atikokan Centennial Museum, the Mining Attraction, and the Scenic Little Falls Golf Club. And, according to Wikipedia, Atikokan is Ojibway for “caribou bones”. However, the neatest thing in Atikokan (remember, in northern Ontario something can be “in” a town and still be 40 minutes away – or in this case, 64 kilometres away by boat or snowmobile) is White Otter Castle. Started in 1905 by a strange local bachelor named Jimmy McQuat, the three story log cabin was built over ten years on the shores of White Otter Lake. 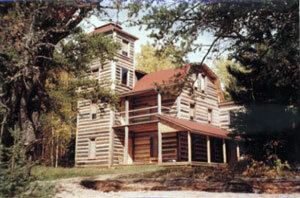 Jimmy single-handedly built his home out of red pine logs. The castle has been restored by the local community and prints by a local artist are on sale for 100$. As for services in town, I don’t have much info. There are some lodges, a motel, a Foodland, and I’m sure a few diners in town. Patrick reports that there is a great little campsite just outside of town. Okay, Jimmy McQuat’s White Otter Castle is a ‘castle’ in the sense that Hamilton, Ontario’s escarpment is a ‘mountain’, but it’s still really freakin’ neat. This entry was posted in The Northwest and tagged amenities, big weird things, hiking, hydro, outfitting, touristy stuff by Highway11.ca Editor. Bookmark the permalink. Greetings! 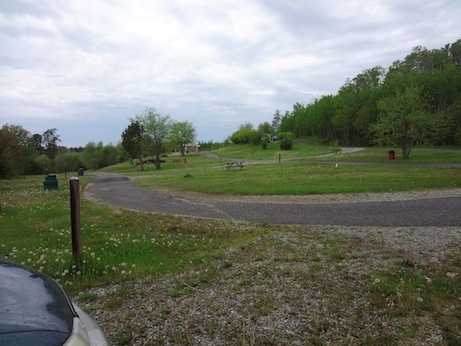 Bravo for your site; and, is appreciated by campers – especially ones involved with road trips – July 2019! Also, The Photo of White Otter Castle, Quetico Provincial Park Ontario is most interesting as well as other photos taken by you along Highway #11 Ontario! Note: July 2019, The Boy Scout World Jamboree will be hosted for the first time by 3 World Countries which include Canada – Mexico – West Virginia USA; and, The Northern Trek from Ely Minn to Quetico – etc Ontario is of great interest to campers !! Thank-you for your contribution to others via your data! Thank you for including my little hometown on your website. Although it’s small, it was the greatest place to grow up. The town is rich in history and spirit. I’m proud to say I’m born and raised!